Carnival Vista sails year-round six- and eight-day cruises. Six-day cruises feature Ocho Rios, Grand Cayman and Cozumel, while a mix of different eight-day itineraries visit some of the Caribbean’s most sought-after destinations, including Aruba, Curacao, Bonaire, Grand Turk, San Juan, St. Kitts, St. Maarten and La Romana (Dominican Republic). The Serenity Adults Retreat is for guests 21 and older. It features complete bar service, whirlpools, and a sun deck with the best views of the sea. The Serenity will have cabanas and massage huts plus a full salad creation bar complimentary so you don't have to go to Lido deck. Indoor/outdoor Camp Ocean for children under age 12 is a dedicated undersea-themed play space with more than 200 fun and educational ocean-inspired activities. 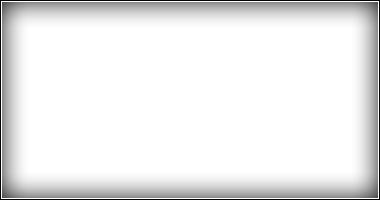 The Game Show where guests are part of the show through a series of larger-than-life productions and entertainment activities based on the company’s iconic and popular games. Carnival Vista, is designed to connect guests to the ocean with sweeping views and plenty to do both outdoors. 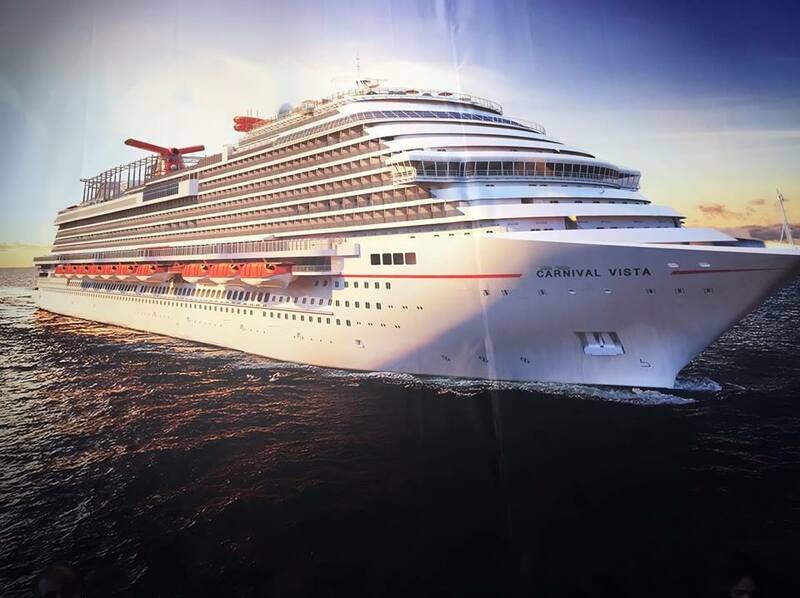 The Carnival Vista features the SkyRide, a breakthrough suspended open-air cycling experience; the world’s first IMAX® Theatre on a ship; an expanded water park featuring the colorful Kaleid-O-Slide, the line’s first raft-riding water tube slide; Seafood Shack, a New England-inspired eatery; RedFrog Pub, including the line’s first onboard brewery, and other enhanced dining, bar and entertainment options. Parents and kids will have even more room to relax at the new, exclusive Family Harbor Lounge, a secluded space designed as the ultimate family hang out with large-screen TVs, games and complimentary breakfast and snacks. A special family concierge desk will be available here to assist families in making this their best vacation ever. The new Havana Pool located aft offers stunning views of the ocean, whirlpools and relaxation area, complete with colorful umbrellas, faux palm trees, thatched patio huts and comfy seating, perfect for soaking up the sun while enjoying a refreshing mojito. • Kaleid-O-Slide, Carnival's first-ever water tube attraction. Riders will hop on inflatable one or two-person rafts taking them on a fun-filled 455-foot adventure of exhilarating twists and turns with stunning kaleidoscopic visual effects. 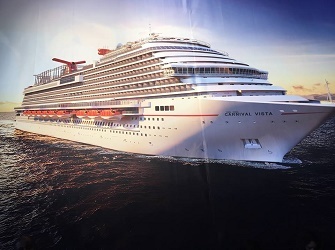 Carnival Vista will offer a wide variety of well-appointed, beautifully designed staterooms and suites including two new accommodation classes. Tropics-inspired Havana Cabanas feature accommodations with private outdoor patios – complete with lounge chairs and hammock – that face the outdoor promenade. Carnival will offer its first-ever outdoor seating options at specialty eateries including Fahrenheit 555, a classic American steakhouse, and Japanese-style Bonsai Sushi restaurant where diners will enjoy sea views as delicious as their meals. Cherry on Top will be the sweetest spot at sea, with a new premium mixed-to-order custom ice cream creation bar, outdoor seating and more than 80 bulk candy options. The intimate Library Bar will also offer guests indoor/outdoor options, in addition to the hoppin’ RedFrog Pub and stylish Havana Bar. Main dining rooms offer an array of menu items for guests who want to enjoy a full-service breakfast, lunch or dinner. The striking modern interiors created by award-winning designer BigTime Design Studios offer decidedly different décor than previous Carnival ships. The Horizons dining room will also feature a unique bar that’s the perfect spot for meeting friends and enjoying a pre-dinner cocktail or an after-meal aperitif. Indoor and outdoor casual dining. Food options include a New York style deli, Indian Tandoor oven, Mongolian Wok, Italian Pasta Bar, and more. Poolside spot for hot burgers, hand-cut fries, more. Choose one of Guy's creations or create your ideal burger. A family-style Italian restaurant that brings the heritage of Carnival’s captains to the table, along with a casual two-level poolside eatery, and a classic American-style steakhouse. Complimentary pasta bar at lunch time but full-service dinner is an extra charge. Onboard Mexican featuring freshly-made tacos and burritos. Homemade tortillas and chips and a salsa bar with choices from mild to hot are always ready to go. Full-service sushi restaurant offering a wide variety of Asian-inspired delicacies and serving soups, sakes, and desserts. Prices range from $1 for appetizer portions to $15 for a sushi ship for two. Located on Promenade Deck. Complimentary 24-hour room service menu delivered to your stateroom any time. Carnival will brew up great beer for good times in its first ever brewery. During each sailing two giant copper-topped glass kettles will create tasty ales and lagers that can be enjoyed on tap from the bar and through unique tabletop taps that allow guests to pour their own beer. The full bar will also offer an array of Caribbean-inspired cocktails, beers and rums. Indoor/outdoor seating, live music and brewing tours and tastings will also be offered in this fun venue. Celebrates the joys of simple indulgences with bins of bulk candy, fun fanciful gifts and novelties, custom apparel and more. Carnival is expanding the line’s popular Latin-infused Havana experience inside and out on Carnival Vista. Celebrating Cuba’s gloried past, Havana Bar serves traditional cocktails and bites during the day and transforms into a sizzling Latin dance club at night. The Vista Atrium will set a festive mood with its giant, multi-deck-high centerpiece that will delight guests with its LED screens and changing visuals to create the right atmosphere. It’s the perfect place to welcome guests boarding the ship, meet friends at the bar or enjoy live entertainment and dancing. The Cloud 9 Spa will feature an array of chill-worthy amenities, including a thalassotherapy pool, four steam chambers, the line’s first infrared sauna and hamam, and special “experience showers” that provide a soothing fragrance element, along with a high-tech indoor cycling studio. Adventurous riders can climb aboard hanging recumbent-like bikes to cycle their way around the 800-foot suspended track with panoramic views from 150 feet above the sea. An exhilarating suspended ropes course. Featuring mini-bowling, ping-pong, arcade basketball, sports video gaming and more. Carnival's first-ever water tube attraction. Riders will hop on inflatable one or two-person rafts taking them on a fun-filled 455-foot adventure of exhilarating twists and turns with stunning kaleidoscopic visual effects.